Actress Anne Meara passed away May 23 at the age of 85. She worked a great deal in TV – her first role was in 1954 — though rarely in sf or fantasy programs. 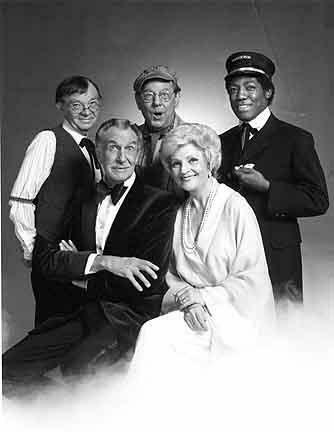 In the Vincent Price/Coral Browne vehicle Time Express (1979), where they were the sophisticated hosts of a train that took its passengers back in time to relive an important moment of their lives, Meara played “the Garbage Man’s wife” opposite her real-life husband and comedy partner Jerry Stiller. The cast of Time Express. She appeared in 8 episodes of Alf and even wrote an episode. In Highway To Hell (1991), a comedy film which also featured her husband and their children, Ann and Ben, Meara was cast as a waitress at Pluto’s. And she shared the screen with Ben Stiller again in Night at the Museum (2006). She and Jerry Stiller initially gained fame as the comedy team “Stiller and Meara.” They were members of the improvisational company, the Compass Players, which later became SCTV (1976). This entry was posted in In Passing and tagged Anne Meara by Mike Glyer. Bookmark the permalink. Hard to breath because they are so funny. I am sad. Sad news. I got to meet her briefly, in another life, long ago, when I was an acting apprentice at the Williamstown Theatre Festival. A great light has gone out. As I recall, one of the books about the early Trek conventions mentioned that she was a Trek fan and ended up speaking at one of said conventions. Don’t recall more specific details. Anne Meara was at least at the 1976 Star Trek Convention, at the Commodore Hotel (with her son Ben in tow, as well, perhaps, as her daughter, Amy). Here’s what I wrote today in the NEW YORK DAILY NEWS, in a brief remembrance, of the great Meara. all the joy she helped engender.